The Sparrowhead (ムシスズメ?, lit. : "Bug Sparrow") is an enemy found in Hey! Pikmin. It is a small, birdlike creature, slightly resembling the Spornet. Its orange body is completely round, and has darker spots on its top. It also has two large bug-like wings, which allow it to fly. 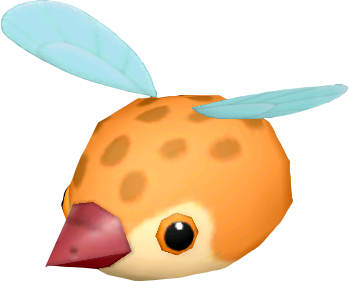 It has black and orange eyes, and a narrow beak that it can stab Pikmin with. It is smaller than Captain Olimar, being about the same width and half of his height. Sparrowheads generally spawn in groups of at least 2 individuals. They remain off-screen until a target walks nearby, which will cause them to descend onto the level. They will then hover in place until they spot a target, which is indicated by a chirping sound they emit. They will attempt to skewer Pikmin or Captain Olimar by flying into them. Sparrowheads can be defeated by throwing Pikmin onto them when they are within reach, which is usually right after they attempt an attack. A Sparrowhead attacking in a cutscene in Mushroom Valley. To do: List links to similar subjects. Particularly: Add categories about what sectors this enemy appears in (e.g. Category:Brilliant Garden). This page was last edited on March 5, 2019, at 17:28.